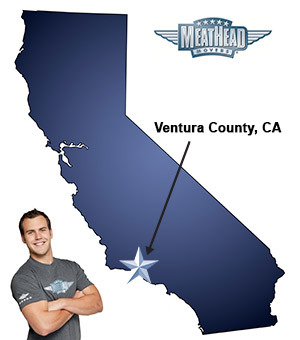 Whatever your moving needs may be, Meathead Movers will help you feel at home in Ventura County. Our professionally trained student-athlete movers and our moving concierge will be with you for the entirety of your move to Ventura County. Nestled between the sea and beautiful rolling hills, Ventura County is a beautiful county with a rich historical background filled with wonderful cultural and community events. We’re proud to have been providing moving services to Ventura County since 1997 and to have opened up our very own facility here in early 2007. We move many people to the area and it’s not hard to see why. You can enjoy your days hiking any number of trails in the mountains surrounding Thousand Oaks or Simi Valley and still have time to catch a sunset stroll on any one of the area’s numerous beaches. Speaking of beaches, the area is known for epic surfing. World famous Rincon is known as a great place to catch the perfect wave or bring a picnic and watch the show at Surfer’s Point. Ventura County hosts a variety of engaging annual events including the Point Magu Air Show, an incredible aeronautical display. This show is also an opportune time for one of the area’s largest employers, the Naval Air Warfare Center, to interact with the community. One of our favorite events is the Ventura County Fair, which is a wonderful family-friendly event that can be visited every August. With total residents nearing the one million mark, Ventura is the 12th most populated county in California, yet still ranks sixth in the state with regards to income per capita. This statistic is helped by the many companies who call Ventura County home, from Amgen, the biotech giant to Boskovich Farms, whose giant farming operations are more in line with the county’s agrarian roots. Whatever the reason for moving to, from, or within Ventura County, we’re here to support you along the way. Our services range from local moving, long-distance moving, packing and even on-site moving for rearranging your home/office or loading rental trucks. We know moving is stressful, but it’s our job to ease your transition. If you are moving to or from Ventura County anytime soon, call or contact Meathead Movers to learn more about our services. Our friendly staff will also be more than happy to give you a free, no-obligation moving quote. Moving to Ventura County? Here are some helpful resources. View more Ventura County resources. For this small “move” MM was perfect. For me, Recommending MM for whole house moves comes with a caveat “MM is the Mercedes Benz of movers, you’ll get amazing service and support but it’ll cost you dearly for it.” My opinion comes after having MM quote my whole house move in Oct. 2017, where MM was almost 3X the least expensive quote I received. I chose not to use MM at that time. This little move of just moving some appliances around was competitively priced and exactly what I was looking for. Prior to the move when I talked w Jack he said he figured it to be a relatively short move as it wasn’t a lot of furniture, mostly boxes & I was only moving approx a1/2 mile away. He didn’t inform me that the drivers would be taking an hour lunch break during my move. Some of the items I had told Jack about the drivers where unaware or unable to move due to the fact they contained a glass top even though I had told everyone prior. The move ended up taking 4.25 hrs not including an hour lunch break & costing me $984.43, instead of the estimated price of min $418. That’s a difference of $566.00. After talking w my family they agreed that price was too high. I filled out the survey at the end saying things were good. I was just happy to have it finished & it wasn’t until I had a bit of time to think on it & discuss it w my family that I realized it was not. I had used your company in the past with a very good result so I was a bit surprised by this move. At this point , except for a refund I’m not sure how you can make things right. I liked that Meathead movers was able to work with me and provide me with a 1 hour service to move a heavy piece of furniture. The movers did a great job and were very easy to get in touch with.